East Ridge Middle School (ERMS) in Lake County, Florida, set out to accomplish a nearly impossible task: raise achievement, implement higher standards, and improve retention, without exceeding the state-mandated class size of 22 or fewer students. Despite the inherent challenges presented by these goals, the school developed a rich culture of teacher collaboration and student achievement. East Ridge Middle wanted to find serious collaboration time so teachers could learn and develop lessons tied to the new Florida Standards (rigorous standards like the Common Core State Standards). Students faced more challenging exams, but with tight budgets (Lake County Schools ranks 65th out of 67 districts in funding in Florida) and rigid class-size caps (1:22 at middle school), East Ridge Middle turned to blended learning. East Ridge explored options for creating a model for Innovative Professional Development (iPD) as part of the Lake County Schools' participation in the iPD initiative with the Bill & Melinda Gates Foundation. Principal Charles McDaniel worked with TimeWise Schools to develop a strategy to offer full-release professional development 18 times year — approximately twice a month — for the core content teachers. An essential part of the model explored was a PLUS Team, a team of six teachers who, in the first year, taught an elective course called Career Research and Decision Making while core content teachers were engaged in PD. East Ridge planned its model in 2013-2014 and launched it the next year. Teachers met twice a month in departmental teams to design lessons, analyze student work and data, and collaborate around the new challenging Florida Standards while the PLUS Team delivered technology-rich lessons aligned to those standards. The PLUS curriculum was Career Research and Decision Making, a college and career readiness course designed to meet the district mission of “C2 Ready,” meaning college and career ready. The students received a semester grade for this course. As an AVID demonstration school, East Ridge instituted a Bring Your Own Device (BYOD) policy that allowed students to augment the school’s technology so teachers could use blended learning strategies. In year 2, East Ridge Middle is further piloting personalized learning (PL) to create a schoolwide PL model of teaching and learning. This natural next step in the school's evolution is further supported by the Lake County Schools' Next Generation Learning Challenge grant, a Bill & Melinda Gates Foundation initiative to “expand promising technology tools and applications that help more students master 6th- through 8th-grade math and literacy competencies, which are critical to college and career readiness.” This work has improved the focus of the East Ridge Middle PLUS Team as it develops project-based learning and personalized learning plans for students and helps build the school implementation of the digital learning platform. Meanwhile, the teacher collaboration has progressed to observing model lessons and developing common assignments. Windy Hill Middle School in Lake County Schools designed a personalized learning model for students that provided lessons in topics like anti-bullying on computers in the media center. This allowed for core-content teachers to meet by department for a full day of collaboration each quarter. Mt. Dora Middle School In Lake County Schools developed a pilot to allow 6th-grade math teachers and 8th-grade ELA teachers additional release time while students learned about areas of interest from non-load-bearing staff, including the principal. 82% of teachers expressed satisfaction and support to continue with iPD for the same number of days or more (18 currently). Very few teachers were absent on iPD days because they had agreed on the first day of the program that attendance would be the norm. Referrals and suspensions were down (until April when Florida State Assessment testing had every school in an uproar). By May, all was back to normal with few referrals. Attendance of teachers was up. Attendance of students was up more than 1%, though the school was already at the top of the district at 95%. All ELA, social studies, and science teachers as well as administrators were trained in the Literacy Design Collaborative (LDC) (minus one teacher who missed all the training). New PLUS curriculum (project-based) was introduced the second year based on core teacher recommendations. New PLUS scoring and student accountability were implemented. As a result of iPD, the PLUS Team took the lead in researching and planning for personalized learning. Civics scores (EOC) were the second highest in the district and above the state average: East Ridge 7th grade, 70% proficient; district, 63% proficient; state, 65% proficient. Science scores (FCAT) were the highest in the district and above the state average: East Ridge 8th grade, 59% proficient; district, 51% proficient; state, 53% proficient. The state of Florida and Lake County Schools use the Marzano Instruction Framework for the teacher evaluation model they call TEAM (Teacher Evaluation and Achievement Model ). For more information, see this link. The district has a robust TEAM teacher evaluation system based on Framework and further supported through its mentoring program. Staff union contracts can be found at the following link. Students at East Ridge Middle take English, math, social studies, science, PE, and an elective. Florida state policy requires end-of-course exams for Algebra 1, civics, and geometry if any 8th-grader is taking it. Teachers teach 5 of 6 periods. Class size reduction policies set class size caps for middle school core content classes at 1:22, unless blended learning is used schoolwide. East Ridge Middle has adopted blended learning and has a Bring Your Own Device (BYOD) policy. 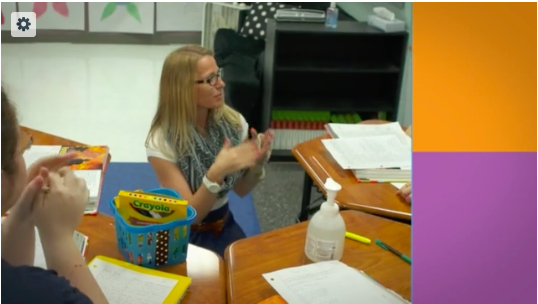 Create significant time for teachers to develop lessons tied to the Florida State Standards. Use blended learning as a strategy to move toward personalized learning. Develop a “Bring Your Own Technology” (BYOT) policy to flood the classrooms with technology. Use TimeWise Resource Optimization strategies to work within existing allocations to create a PLUS team and provide 18 full release days for departmental team collaboration. Provide team time during common planning periods. Use Literacy Design Collaborative (LDC) tools and strategies to organize and focus on instruction during professional development sessions with an emphasis on Innovative Professional Development (iPD) lesson study. Create a culture of continuous improvement informed by multiple data sources, including surveys, mini-task results, and student achievement. Classroom conditions must be better for teaching and learning. The school redesign must lead to improved conditions in the classroom. What students are doing in PLUS time must serve them well. The work students do while teachers are collaborating needs to be instructionally strong, supportive, and engaging. Early dismissal from school is not an option. PD must be relevant and real. The content of teacher learning must be driven by classroom realities and teacher needs. At East Ridge Middle, the Lake County Schools scope & sequence and district blueprints provide a framework for common learning experiences across the district. They outline student expectations aligned to the Florida State Standards. The curriculum blueprints for each unit are hyperlinked within the scope and sequence and are meant to be used as a starting point for collaborative unit planning. By example, here is the math scope and sequence. As part of the school’s blended learning program, the district adopted a Bring your Own Device (BYOD) initiative. The BYOD initiative not only allowed the school to negotiate the state's class-size caps, it also increased access to technology at the financially struggling school and boosted student engagement as devices that were formerly restricted now had a purpose in the classroom. East Ridge Middle is also retooling its instruction in order to integrate new Florida State Standards into the classroom. More challenging state standards coincide with higher expectations for students as East Ridge Middle also hosts an AVID program. In fact, the school is an AVID national demonstration school and has earned the rare designation of AVID School of Distinction. AVID strategies have been implemented schoolwide, and every classroom has visuals reminding students of the AVID instructional priorities, such as Cornell Notes (a note-taking system) and WICOR (writing, inquiry, collaboration, organization, reading). Cornell Notes are the norm as students are held to higher standards in preparation for more rigorous coursework and eventually college. Principal Amy Cockcroft developed a personalized learning strategy for students in the media center. She marshalled available technology and developed personalized playlists for students to experience rich virtual and online learning experiences under the supervision or her media specialist and other available staff. The opportunity for “voice and choice,” a key component of personalized learning for students, not only allowed teachers to have a full day to develop lessons and analyze student work, but this positioned the school to move more aggressively toward personalized learning and blended learning schoolwide. East Ridge Middle students in grades 6-8 take six classes and one PLUS class: English, math, history, science, PE, and an elective. The PLUS class is offered at least twice a month, sometimes back-to-back based on the schedule, while their teachers are in professional learning for the day. Students learn through literacy- and technology-rich lessons. Grades for this work go to the core teacher and comprise no more than 5% of the total grade for that class for the time period of the project. Algebra 1 and civics courses have end-of-course exams (EOCs). Lake County Schools administers PSAT 8/9 annually at middle school. State assessments called the Florida Standards Assessments (FSAs), are administered annually in the spring for ELA and math. The Florida Comprehensive Assessment Test (FCAT) is administered annually in the spring in science. Seventh-graders take the civics end-of-course test. Core content teachers (English, math, social studies, and science) are organized into nine four-person teams for grades 6-8. Teachers teach 5 of 6 periods. Students take six courses in heterogeneous groups. Teams have a common prep period daily and professional learning communities on early-release Wednesdays once a month. Departments have a full day of collaboration approximately twice a month and professional learning communities on early-release Wednesdays twice a month. In addition, the full faculty meets once a month on early-release Wednesdays and, if there is a fifth Wednesday in the month, faculty members get a voice and choice over what is offered for them. PLUS teachers teach three weeks and have Spartan Support Week the fourth week, which allows them to mentor and assist teachers and help students who need repair work. Grade-level teacher teams meet in common planning periods by team and collaborate further once a month during PLCs (professional learning communities) on early-release Wednesdays. All students on a team see the same PLUS teacher. PLUS teachers rotate through four disciplines, allowing interdisciplinary curriculum projects. Language arts and math core courses retain four consecutive days of instruction. East Ridge Middle has shifted its professional development to a more personalized learning model for teachers. In addition to the team-based PLCs on early-release Wednesdays (the districtwide model) and the mentoring for beginning teachers (based on the New Teacher Center Model), East Ridge Middle core-content teachers collaborate by department on 18 full-release days. Developed as part of their Innovative Professional Development (iPD) project through the Bill & Melinda Gates Foundation, East Ridge Middle teachers within departments engage in lesson study, common planning, data analysis and incorporating technology into their instruction. In 2014-2015, Windy Hill Middle School in Lake County Schools implemented a strategy to provide teachers in each core content department one full-release day quarterly. The changes in East Ridge Middle have resulted in more engaged students and higher student achievement. Since the inception of this strategic shift, the culture has improved dramatically. A culture of collaboration has created a culture of learning and, as a result, behavioral referrals have dropped 40%. Student surveys further illustrate student satisfaction with the new model. Student comments about the new design included the following: "It lets me learn at my own pace." "We can learn about ourselves and what career we want to do when we grow up." "I feel that teachers genuinely care about our academics." "Teachers help students get career ready." "I like how the class focuses on real world issues." "I like the PLUS class because it teaches you how to be a better person." "Blended learning lets me go at my own pace and not get lost along the way." "Blended learning helps us with technology for the future." Before the implementation of Innovative Professional Development (iPD), East Ridge Middle teachers planned mostly in isolation with only twice-monthly hour-long departmental PLC’s. Vertical and horizontal planning rarely happened. Now teachers collaborate regularly using a lesson study process that is improving teacher practice and student outcomes. Teachers collaborate by team weekly and by department every four weeks. Both vertical and horizontal alignment activities are possible in the model. Surveys show 82% of staff are satisfied with the changes. Universally, teachers agree to maintain the school model with some adaptations to the student learning in PLUS classes. Principal McDaniel sees parents as important partners in the education of students. He communicates regularly, encourages parent and volunteer involvement, and loops parents in on what is coming up in the schools. In 2014-2015, for this inititative, he held parent meetings to share about his commitment to teacher collaboration as a strategy to improve students achievement and the use of the PLUS Team. He also informed parents about the BYOD initiative through meetings and mailings. To learn more, see this link. Resources for parents specifically can be found at this link.